There were some big shake ups in week 11 that will affect the BCS standings. When the official standings come out, there will be a lot of controversy, but for now I am going to tell you what I think should be the BCS standings. The Tide made a huge statement last Saturday night by rocking the Bayou Bengals. LSU tied the game in the third quarter, but after a surprising fake punt, Bama scored 21 unanswered points. The Tigers failed to score a single point after that, and Alabama rolled 39-17. This was the kind of game that voters needed to see from the Tide. They have not had a statement win yet, until the LSU game. The key to Alabama’s success is star QB AJ McCarron. McCarron isn’t the flashiest player. He doesn’t run around and make huge plays, all AJ does is win championships. McCarron has been amazing every game, but running back TJ Yeldon was the true reason the Tide rolled the Tigers. The Alabama run game has been the weak part of this team, but if last Saturday was the first time you tuned in, you would never guess that. 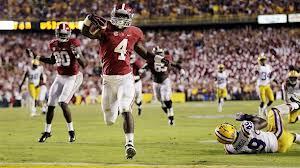 Yeldon carried the ball for 133 yards and 2 touchdowns. In the second half Saban changed the game plan and ran the ball down the Tigers throat. I have been doubting this Bama team all year, but now that they have a solid run game and I have finally jumped on the Tuscaloosa bandwagon. This team is legit. In my opinion, Florida State is the most complete team in college football. First off, they have arguably the best player in the nation, Jameis Winston. 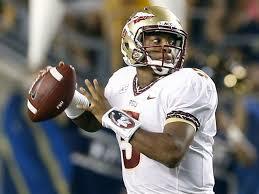 Winston is remarkable, he plays like he is a five year senior but he is only a freshman. Scary right? They have one of the best receiving cores, which makes Winston look even better then he really is. Junior WR, Rashad Greene, has been sensational, leading the team in receiving yards with 820 YDS on the season and he also leads the team with 8 receiving TDs. Last week, what impressed me the most was the Noles defense. Against Wake Forest, they forced 6 interceptions and 7 total turnovers. Wake Forest also only threw 7 complete passes. Yes they had only one more completed pass then they had interceptions. This defense is stifling and they also take the weight off the Winston’s shoulders. Jimbo Fisher has done a great job making this team believe they can win. WATCH OUT BAMA! The Ducks suffered their first loss of the season Thursday night in Palo Alto against Stanford. You might think I am crazy for keeping the Ducks in the top three just after a loss, but Oregon didn’t play Oregon football. I give Stanford a lot of credit, but Oregon just had a bad game until 3 minuets left in the 4th quarter. 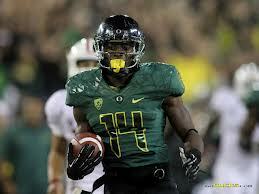 The Ducks played horrid and still only lost 20-26 to a very good Stanford team. The Ducks have the best player in all of the land and the greatest offense. Mariota and his Ducks need a whole lot to happen to make the National Championship but there is still a chance. This team is way better then how they played against the Cardinals. Trust me, this Oregon team is still very talented. A couple years ago if you said the Baylor Bears are one of the best teams in the country, someone would check you into a mental institution to see if you were insane. The Bears are what many people are calling the Oregon of the South. The fancy uniforms, the offense, and the that they just flat out win ball games. The Bears had a statement win, last thursday vs Oklahoma. 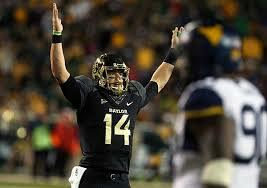 The Baylor Bears are for real. This entry was posted in College Football, NCAA Football, Uncategorized and tagged AJ McCarron, Alabama Crimson Tide, Baylor Bears, Florida State Seminoles, Jameis Winston, Jimbo Fisher, LSU Tigers, Marcus Mariota, Nick Saban, Oregon Ducks, Rashad Greene, TJ Yeldon, Wake Forest by just1mike. Bookmark the permalink.